When you make the decision to sign up for a half-marathon, usually by then you already have some sense of the time commitment required in the coming months. If you follow some of the structured running plans, experts tell you that on different days you will be gradually building up your training and performing different kinds of runs (not just long distances) in order to work your muscles, your cardio and overall endurance in different ways. Then you need to follow up that training with yoga sessions or stretching exercises, lots of time to rest and sleep to properly recover, as well as time in the kitchen to prepare healthy recovery meals and snacks. Clearly it is a significant time commitment. However in all the friendly tips, hints and warnings, people seem to leave something out… preparation time. 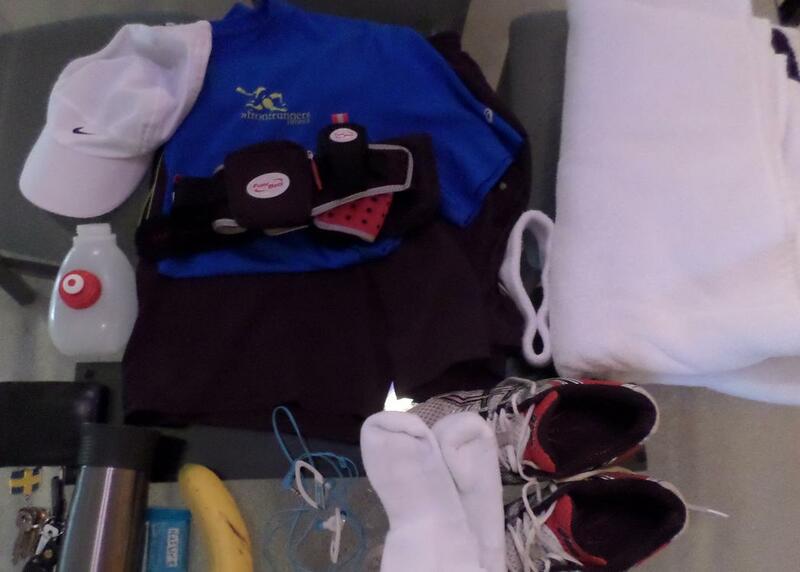 Specifically, how long it takes to prepare for a 16, 18 or 20 km long run. On some days, I swear it takes me less time to pack a suitcase for a weekend away involving formal wear, two changes in weather patterns and a change of seasons. We often hear the sage advice of having our running clothes prepared, in one spot and ready to go, thus minimizing opportunity to lose interest while hunting for running gear. If I am going for a short neighbourhood run, yes, that works great! This is especially valuable when I need to go for a run after a challenging work day. With this advice, I can be out the door in a matter of minutes. – Just before I leave, pee again. As you can see, the fact that I can leave the house at all to do a long run is already an achievement, worthy of my free t-shirt and my medal. But after a few weeks of preparing for this lengthy ritual, just like anything, a learning curve set in and I started finding shortcuts. If I didn’t, the ritual would just keep getting longer and I could potentially lose interest and flop back on the couch, grab a pillow and a blankie, and watch TV. Is this time investment worth it? It absolutely is! Meticulous preparation can only help meet one’s goals, by enabling a comfortable and (hopefully) injury-free run and a quicker recovery from it. In all sincerity, having made it this far, and with only a few weeks to go, determination has me on auto-pilot. I am pretty good at making it out and training to prepare my body for the big race. I admit there are some nights I can feel my body is still recovering from the last training activity and feel sleepy. When that happens, I listen to my body, have a good dinner and will likely go to bed early. But at this point, those “I don’t feel like it” nights don’t seem to haunt me anymore… we’ll see if that continues after the race. With my long runs now above the 18 km range, I am already very proud as each additional step is a new record for me as I push the bar gradually upwards. The best part is that no body parts have fallen off yet (…yes, I still have all my toenails intact!.. YAY!) To me, I am already a winner!